This is the first admission for Hussein, a one and a half year old boy from Jericho. Hussein is the third child of intermarriage after his brothers; Osama (9 years) and Saher (7 year). Wafa’, Hussein’s mother, became aware of her son’s condition after her experience with her first child who suffers from brain atrophy and global psychomotor delay. Hussein had his check up in the Jericho Municipality Community Center, a partner Community Based Rehabilitation Centre with JPBC. After diagnosis, Hussein was detected with mircrocephaly (small head circumference) and consequently suffers from delayed development. Therefore, he was referred to JPBC to receive comprehensive rehabilitation services. While Hussein was admitted to JPBC rehabilitation centre, his mother was directly enrolled in the Mothers’ Empowerment Program. Wafa has participated in all the sessions and learnt how to perform the recommended exercises for Hussein at home. She also attended the psycho-social and debriefing sessions that helped her vent all her frustrations. In addition to this, she also attended the awareness raising sessions that better improved her understanding on the needs of her children with disabilities. Wafa faced many challenges by leaving her eldest son, who is also a child with disability. She felt obliged to choose one son over the other which made her weighed down by guilt regarding her decision to come to JPBC. She is a working mother, who takes care of the house beginning with cooking, cleaning, washing, and also looks after her eldest child Usamah who is in constant need of her care and love. “This is my first time to leave the house, and I miss spending time with my husband and children. It was very touching to hear similar stories from other mothers, ones with more challenging conditions. This helped me a lot and made me a stronger person,” she said. The psychosocial sessions helped Wafa to release her frustrations and eliminate the pressure she had. 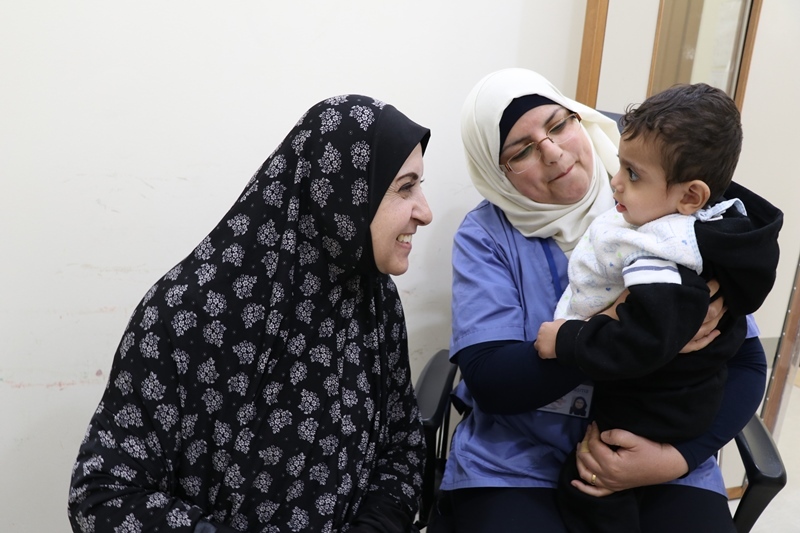 Hussein’s mother was highly satisfied with the treatment her child received and she even noticed a visible improvement in Hussein’s condition only after three weeks of his admission. During that time, Hussein received Physiotherapy, Occupational therapy, Speech and Language therapy, Music therapy, and group psychosocial support sessions. As per the assessment of the #therapists and Hussein’s mother, Hussein has demonstrated high responsiveness to the therapies. Indeed, his impulsiveness decreased and he started to walk side steps after standing firmly and then gradually lowering down to sit or crawl. This was achieved after being trained to do movements to strengthen his pelvis stability. Hussein was also trained to do exercises that involved bilateral hand use activities, joint attention activities, coordination between his legs and arms, fine motor skills exercises, as well as sensory integration exercises. Other trainings included symbolic plays that were used to cognitive stimulation, orofacial stimulation to strengthen his facial muscles, in addition to activities related to enhance responsiveness to orders, imitation activities, behavioral modification that improved his growth and development. “I look forward to go back home, I miss my children so much, and I also want to empower all the members of the family with the exercises I’ve learnt in order to implement on Hussein”, Wafa’ said and continued, “I am confident that Hussein will improve in three months and JPBC multi-disciplinary team will certainly witness the remarkable progress on my son when I follow up through the Outreach Program”. “I strive to bring out the best abilities in Hussein and achieve utmost results due to JPBC endeavors towards my son’s development”, Wafa’ concluded. On behalf of all staff at the Jerusalem Princess Basma Centre, we -at JPBC- extend our heartfelt gratitude for the American Friends of the Diocese of Jerusalem for their generous support to the Mother Empowerment Programme. Such a program enables mothers of children with disabilities – like Wafa’- to gain expertise and acquire the skills as to carry on the treatment they have started at the Centre, thus allowing their children reach their maximum level of independence.